The best pitches are two to three minutes long. They’re succinct, concise, and exciting. Speaking with passion and knowledge for three minutes will express your story better than a nervous, convoluted ten minute ramble. Fight to get it down to the minimum length possible. Six hundred words is about right if you’re writing it out. Remember, a pitch is a sale. You’re selling an idea, a script, and yourself. You’ve got to be passionate about all of those. And you have to be passionate about the production process – don’t go in expecting them to answer your questions about what’s next, know it. You also have to be passionate about pitching to exactly the person you’re speaking with – do your research and tell them why they’re the best person to get involved in your project. That’s a lot of passion for a lot of things, but you can do it. This should go without saying, but dressing the part is equally as important as having a good pitch. Showing up in a baseball cap and hoodie says you’re going to the gym, not a presentation. The same goes for any print materials you decide to bring along. A black and white one-sheet printed on standard paper is not going to cut it. Splurge a little on printing and learn how to use photoshop if you don’t already. The idea isn’t to spill your entire story. You want to hook them, but leave them wanting more. In your verbal presentation, this means you don’t necessarily tell them the ending. Let them ask for it. If they do, you know you’ve hooked. Leave a few questions for the end so you can discuss. Bring a one-sheet, but don’t bring your pitch package. Let them know you’ll provide it at their request. This gives you another “in” after the pitch and helps them remember you a couple of days later. 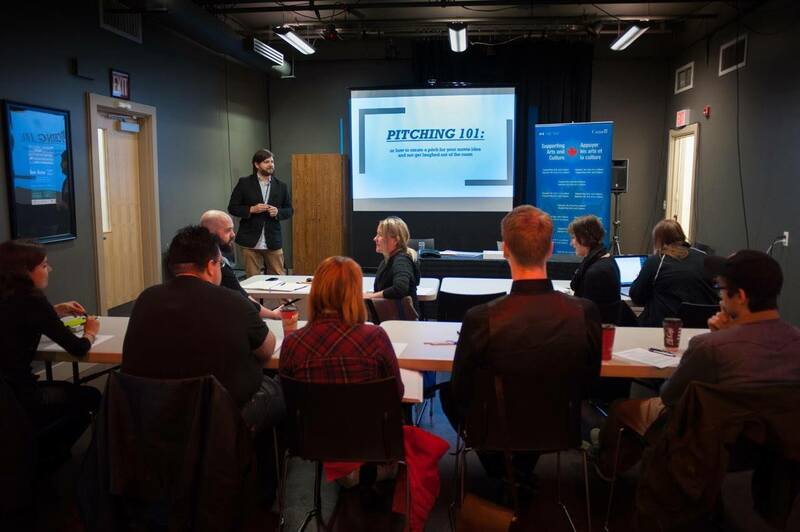 After the verbal pitch and discussion, you’ll hopefully be asked for your one-sheet and pitch package. Some will bring the whole package with them. Some will only have a one-sheet. Ideally, you bring the one-sheet with you and have a pitch package ready to email, courier, or drop-off as a follow-up. This way, you leave them wanting more and have a chance to make a second impression! So what does a pitch package look like? The one sheet is one sheet of two-sided paper. On the front should be your movie poster – a visual image designed for maximum impact. If a picture tells a thousand words, this is your chance to double or triple the word length of your pitch. The “poster” will typically also show a Heading, which includes the film’s title, the author’s name(s), the genre, and possibly the project’s length. It may also show a tagline, which is not to be confused with the logline. Marty McFly, a typical 1980’s American teen, finds himself speeding to the past in a plutonium powered DeLorean when he tries to escape the Libyan terrorists who’ve killed his friend, Doc Brown. As if being stuck in the past weren’t bad enough, Marty’s hijinks attract the attention of his mother, distracting her from meeting his father, meaning he may never be born. Can Marty save the day, his skin, and get back to the future by making his parents fall in love, finding Doc Brown in 1955, and creating a way to get home to the 1980s? After the initial title page, you pitch package should be anywhere from 5-8 pages long. Use the colors and imagery from your poster to create a visual theme for the whole package. This shouldn’t look like a binder of your drawings and scratchings, but be a glossy, printed, mini-magazine. You’ll want to include Character Breakdowns, summarizing each of your central characters in two to four sentences. Keep it short and snappy, giving a sense of who they are, not every detail of their existence. Focus on traits, flaws, and challenges. If you’ve envisioned a particular actor playing this role, feel free to present that information visually. Casting Suggestions should include two or three characters for each role, including an indie or local counterpart to any Hollywood actors. Impress your audience by knowing the actor’s agents. Casting Suggestions usually entail giving “hope to work with” information. But your production may already have a Writer, Director, Producer, Director of Photography, or bankable cast. If so, this Above The Line information should be provided. Include a short biography of each member of the creative team and use their skills to sell your project. Finally, the pitch package should include a Director’s Vision. Or, if no director is yet attached, a Vision. The vision shows your audience that you’re invested in making this film come to life. It should provide a description of the visual representation of the film. Topics may include: Themes, Visual Design, Art, Camera Style, Music/Sound Treatment, and more. These are the basic elements of a pitch package. It’s possible to include more, but inadvisable to include less. In the end, the purpose is to sell your film to investors and/or producers and the pitch package is your chance to show that your project is serious and saleable.